Boca Juniors had traveled to face San Lorenzo in a pre-season friendly. File photo taken when Boca Juniors faced River Plate in May. Image: Images by Press Association. 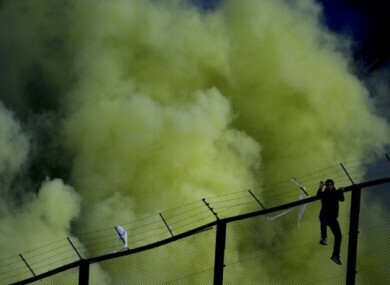 ONE MAN HAS been killed and several injured tonight as rival factions rioted before a supposed pre-season ‘friendly’ in Buenos Aires. The match between San Lorenzo and Boca Juniors took place at San Lorenzo’s Nuevo Gasometro ground on the outskirts of the Argentine capital. Local media reports (translated by Yahoo Sport ) said a 35-year-old man had died of a gunshot wound to his chest. The game was suspended amid the riots with several more reported injured in the violence. In the closing stages of last season, the Argentine FA had ordered all games to be played without visiting supporters after the death of a Lanus fan as crowds clashed with the police. Email “Man shot dead as hooligans clash in Buenos Aires”. Feedback on “Man shot dead as hooligans clash in Buenos Aires”.